I was nine years old when my mother decided it was time I took part in the family business. I was pretty enough now, she said, that I might be of use. I'd grown into my ears and my long neck and might be clever enough to handle myself. Besides which, she claimed, she had no other option. Let me set the scene - 1872, Victorian London. Instantly I am whisked back into a time where Gothic charm was all the rage. Violet, the heroine of the story has spent most of her childhood helping her mother create elaborate and fake seances for the rich and famous people of London. Life begins to improve for the family as they become more well known for her mother's skills as a medium. 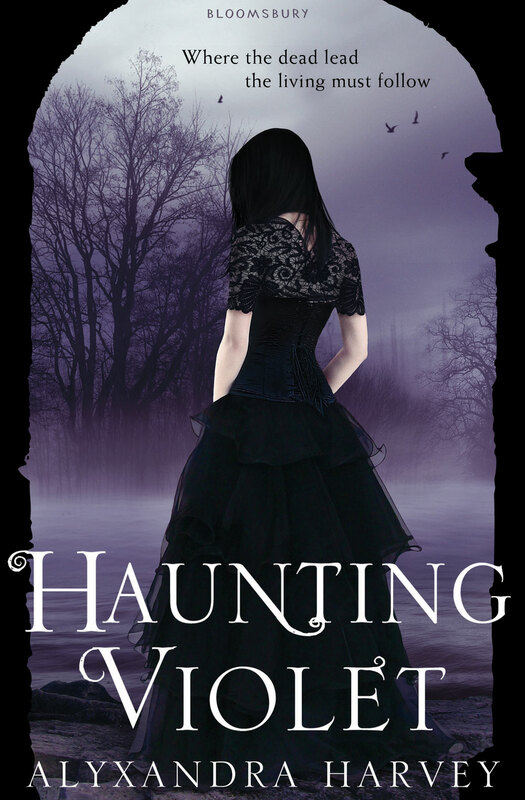 During a visit to Lord Jasper's mansion, for a weekend of mediumship, Violet is shocked to discover that she can actually see and hear ghosts. She doesn't want the skill of being a medium and becomes haunted day and night by the ghost of a drowned girl who wants her murder avenged. Violet will get no rest until she discovers the real murderer who may just be about to strike again. As soon as I realised this book would have a Gothic feel to it, I wanted it. I am sure deep down I have my very own Goth girl fighting to escape motherhood and wanting to be free to dress in black and resemble Morticia from the Addams Family. So, it was fantastic to be able to get my hands on this book early and absorb all that lovely gothicness! Right from the beginning, I found that the Victorian scene was set rather well and the smoggy Victorian London came alive again. The book is very atmospheric and eerie, a feeling that whispers in an out of each page throughout the book. Violet is such a gutsy main character who deals with her new found talent at first with ill ease, but soon manages to cope with all that is thrown at her. Despite the abuse thrown at her from her mother, she is courageous through out. I loved Elizabeth, her friend from a noble background, who reminded me a little of Velma from Scooby Doo. She is determined to help Violet solve the mystery, as well as eat her way out of a corset. At times the story was funny and had me sniggering a little as Violet did a few rather daft things, then the book would delve straight back into the paranormal element to push you deeper into the unsolved mystery. I do love a good ghost story and this one definitely fitted the bill. I loved the way Rowena's apparition was described and the eeriness she added to the book. The murder was not easy to detect and I found the author threw in quite a few red herrings to distract the reader from the truth. I found the story to be jam packed with action that kept me thrilled until the murder was solved. There is no time to rest with Alyxandra Harvey, she keeps you on your toes all the way through the book. Last year I read We Hear The Dead by Dianne K. Salerni, which tells the fictional story of the true life Fox sisters who actually fooled the world into thinking they were mediums. 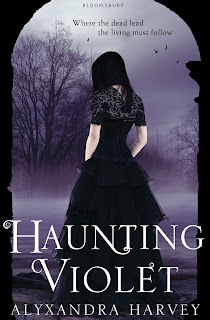 Both books showed a great amount of detail concerning spiritualism during the 1800's, however, out of the two books, I would have to say that Haunting Violet was actually much better, as it had more of a thrill and a mystery to it as well as an extremely good climatic ending. A truly enjoyable read that leaves you satisfied by the last word. I do hope we get to meet Violet again soon. Sounds fabulous. I do love a good goosebump raiser. This passage had just enough of the creep-factor. Liked it! This is sat on my bedside table at home - i can't wait to get around to reading it! the Victorian setting sounds fab! Victorian London - I'm hooked already. Oh this one sounds good and yes you had me hooked at Victorian London! Victorian London and a gothic feel make this sound so appealing to me. I may sound like a small child when I say that ghost stories often terrify me, but I really think I´d like this book. So, on to the wishlist it goes. :( I want this book so badly. I need to get my copy ordered! Victorian London? Ghost story? I think it's exactly what I like! This book sounds fabulously gothic! Ever since I took a gothic lit class a couple years back I haven't been reading much from the genre even though I discovered that I absolutely loved it!